Eagle Mountain House Dining - Jackson NH and Mt. Washington Valley Area Information. Pumpkin People, Tradionally Yours Events, Lodging specials, Dining and Ski Area Info. Highfields Restaurant is a relaxed casual dining experience celebrating the fresh ingredients of New England. 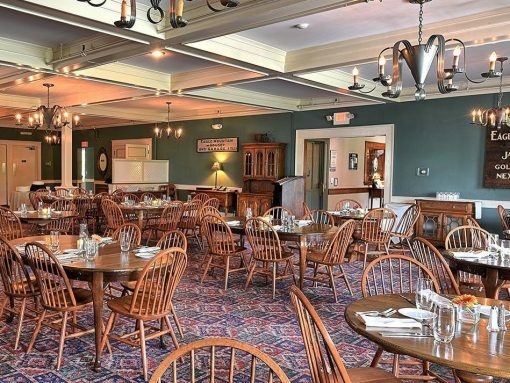 True to its Victorian heritage, our dinner menu is varied and features classic New England cuisine served by picture windows that overlook rolling fields. The Eagle Landing Tavern is a great place to meet with friends before and after dinner, or for a lighter meal. The menu of snacks, appetizers and signature sandwiches are served alongside memorabilia and old time photographs of “The Eagle” and the surrounding Jackson area. The Veranda cafe is open seasonally for outdoor dining.